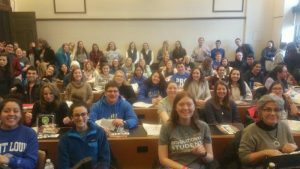 On January 20, FFL President Serrin Foster spoke to 225 students at the Cardinal O’Connor Conference on Life, the largest student-run pro-life conference in the nation. It has been an exhilarating (and exhausting!) three weeks. This year marked Feminists for Life’s largest presence ever at pro-life demonstrations across the country, from Chicago, to D.C., to San Francisco, and (almost) everywhere in between. • Human Life Review published “The Feminist Case Against Abortion” for their year-end issue. • January 8: My article on sexual harassment on airlines was published on DailyClout, Naomi Wolf’s site read by one million largely pro-choice millennials. • January 8: Ohio FFL member Marilyn Kopp had a letter published in The Cleveland Plain Dealer, reflecting on the losses America has experienced since Roe v. Wade. • January 18: America magazine published my feature article explaining why pro-life feminism is more important than ever. • January 18: New FFL Board member Kara Sorenson spoke to over 1,000 young activists at the D.C. March for Life Youth Rally. They each got an FFL coEXIST bumper sticker (thanks to donors like you!). • January 19: My opinion editorial was published in National Review calling for cooperation between Women’s March organizers and pro-life feminists to unite around women-centered solutions. • January 19: Marilyn had an op-ed published in The Washington Examiner to share our pro-life feminist history. • January 19: I was quoted in Christianity Today about how pro-life feminists can find common ground by addressing sexual harassment and answering women’s unmet needs that drive them to abortion. • January 19: NBC Washington interviewed FFL volunteer and Twitter coordinator Colette Moran at the D.C. March for Life about her own experience as a student parent. • January 19: WMAL interviewed Editor Damian Geminder and Colette about FFL’s unique role in the pro-life movement. • Columbia magazine, read by 1.6 million Knights of Columbus households, featured numerous photos of “Women Deserve Better®” placards in their photo retrospective in their January 2018 issue dedicated to 45 years after Roe and Doe. They also included the suffragists’ opposition to abortion in their historic timeline. • January 23: Former intern Katherine Beck was featured in National Review to discuss the vandalization of a student pro-life display at the College of William & Mary. Thank you so much to all of the donors and volunteers who pitched in to make this month an unprecedented success. Now it is time to refill our coffers to take the next steps as we walk in the footsteps of our feminist foremothers. March forth. PS: Between the extremes of the Antifa and anti-fem movements on campus, there are courageous students like former FFL intern Tatiana Federoff, who was instrumental in bringing me to Franciscan University of Steubenville. Watch as she leads a panel discussion to analyze the impact of FFL’s message and solutions on campus. Now is the time to contact info@feministsforlife.org to bring a pro-life feminist speaker to your campus (and get your FREE kit! ).